Softan has created HOME&BABY products,where in the most functional and fashionable way possible. Softan is always absorbing global fresh ideas,creates "High-quality goods at reasonable prices" style and features. Softan Brand continues to bring our customers the joviality and pleasant surprise,expresses the unique personality of refined lifestyle. When purchasing softan goods,we will always provide you with the best service. If you have problems or dissatisfaction,please contact us anytime. Our company will resolve the problem with all your strength. 1:Material:100% cotton,the hooded towel features a looped terry design for enhanced absorption and moisture retention. 2:Size:30*36"for hooded towels and 24*47"for hooded poncho. 3:Exquisite Craft:Double Stitched Hemmed Finishing.The towels come with double stitched hemmed finishing for less amount of disintegration after washing. 4:Five Styles:Three for hooded towels like owl,unicorn,and alpaca,and two for hooded ponchos like alpaca and monster. 1:Pls wash before first use. 2:Avoid fabric softeners,bleaching agents,household cleaning products, personal products that contain peroxide and laundry detergents containing harsh optical brighteners. 3:Besides,towel and poncho is different,pls carefully check the picture before placing an order. 4:Different monitor settings might cause slight color difference. High Premium Fabric:100% organic cotton.Super absorbent fabric for quick drying,softness and comfort.Also eco-friendly,there comes no harmful factors to your kids;Wears cozy on your baby without any heavy feelings,really perfect for baby shower. Adorable Cartoon Design:Our cotton hooded towels are all embroidered with animal patterns.Here comes two animal styles,your babies can be dressed as Adorable Alpaca or Mighty Monster when wrapped up in softan hooded towel;Unknowingly bringing fun to your kid's childhood. 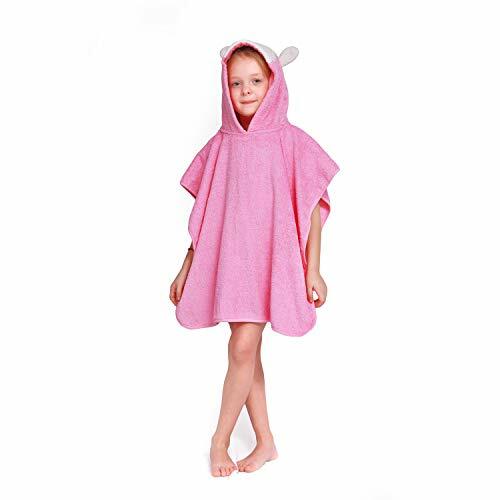 Great Fit For Your Kids:One size,measures 24x47 in inch when unfolding,suitable for 1-6 years old toddlers and kids;Large enough to wrap around your baby perfectly,also can effectively keep your baby skin dry and warm after bathing. Versatile Towel:It is not only a towel to dry baby's body after bathing,but also can be perfectly worked as clothes to cover baby when sleeping.Besides,you can use it for your baby in swim time at the pool or family time on beach,etc.Also special shower gifts for your kids.Makes the perfect birthday surprise or magical holiday present. Washing Instructions:Machine wash is also available;Wash in cold with like colors;On gentle/delicate cycle;Tumble dry on low heat. If you have any questions about this product by softan, contact us by completing and submitting the form below. If you are looking for a specif part number, please include it with your message.